In the continental US DIRECTV provides coverage on 5 satellites, including Standard Definition, Ku-Band coverage on 101W, and High Definition coverage on Ka Band on 99W, 103 W and two other satellites. In the marine market, there are a few antennas that provide high definition TV, using a triode feed, which receives three satellites simultaneously; Ka-Band at 99W, Ku-band at 101W, and Ka-Band at 103W. In the ~one meter market are the KVH HD11, and Intellian S80 and the sub-meter market the KVH HD7 and the Intellian S6HD. Cobham Satcom are rumored to be coming out with a 1 meter HD antenna later this year. DirecTV US high definition TV uses 5 satellites with two High Def Ka-band satellites located at 99W, and 103W and 3 Ku Band, standard def satellites located at 101W, with some additional channels on 110W and 119W. Special LNB combinations on special antennas allow one to see Ku 101W as well as Ka 99W and 103W on either side. Some LNB combinations allow one to see all five satellites. The SWM (pronounced SWiM) Single Wire Multiswitch allows one to run a single cable which is shared via a splitter by up to 8 receivers. The SWM modulates the selected bands from the LNBs onto 8 channels, one for each receiver. The band/pol selection from each receiver is put onto it's particular channel allowing up to 8 decoders to split off the same coaxial cable. Multiple SWMs can be cascaded for more receivers, but normaly there is one coax run for each 8 receivers. 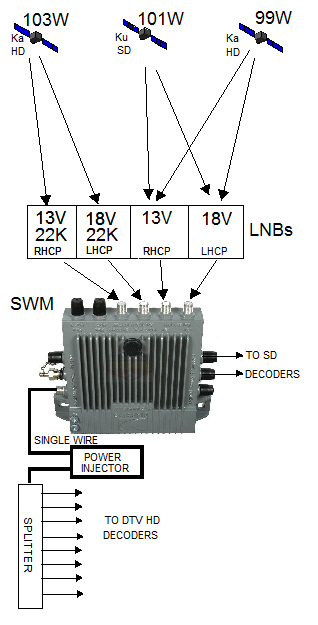 The SWM compatible DirecTV decoders signal the multisitch using DiSecq, 13V, 18V and 22KHz tone to tell the SWM which satellite and which pol and it wants to watch. The SWM then modulates the required satellite and pol onto the coax on that receivers carrier that has been assigned by the SWM module. 24758 visits to this page since 28 Nov 2012.